Demi-glace is a sauce used in French cuisine. It is made out of equal amount of veal stock and espagnole sauce. 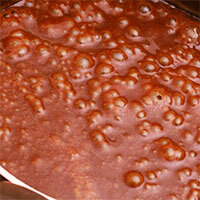 The espagnole sauce has a very strong taste and is rarely applied directly on food. It consists of roux (wheat flour and butter) to which water or weal stock is added, along with vegetables, tomato paste, pieces of beef, and various seasonings and spices. Alternatively, demi-glace can be made with any other type of meat stock. Demi-glace sauce is not particularly diet friendly, as it contains a lot of fat, but it does satisfy the appetite and it is used sparingly, so little can go a long way. The calories in Demi-Glace per 124.1g(1 ladleful) is 204 calories. Demi-Glace is calculated to be 164Cal per 100 grams making 80Cal equivalent to 48.78g with 14.74g of mostly fat、7.69g of carbohydrates、4.8g of protein in 124.1g while being rich in vitamins and minerals such as Vitamin A Retinol Equivalent and Vitamin B6.